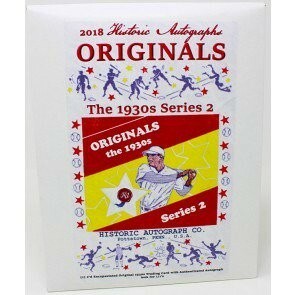 Historic Autographs is back at it with Originals, the 1930s Series 2. Originals, the 1930s matches original cards from the decade with cut signatures. A total of 120 players are featured in the limited edition release, of which 30 are Hall of Famers. 26 of the 120 players are short printed (to between 2 and 5 cards per) and all other players have a minimum print run of 8 and a max of 25. Hall of Famers & Short Prints fall 4 per case. Look for 1/1 versions falling better than 1 in every 2 cases. The total production run will be (100) hand numbered 15-box cases. Key players on the checklist include Lou Gehrig, Ty Cobb, Jimmie Foxx, Joe Medwick, Charlie Gehringer, Lefty Grove, Bill Dickey, Pie Traynor, Al Simmons, Heinie Manush, Mickey Cochrane, Goose Goslin and more. Look for over 50 1/1 players including Babe Ruth, Lefty Gomez, Jim Bottomley, Gabby Hartnett and Chick Hafey.